Today, a French court of appeal stopped all inquiries into a 160 million Euros portfolio held in France, and allegedly acquired with stolen public funds, by the leaders of some of Africa’s poorest countries. The case was brought by the organization Transparency International, based in Berlin, against the president of Equatorial Guinea Teodoro Obiang, the president of Congo Denis Sassou Nguesso and deceased former president of Gabon Omar Bongo. The lawsuit was dropped after the Paris appeal court ruled that Transparency International could not itself bring a complaint the three African heads of state because the organization had no judicial interest in the case since it had not been directly affected. Transparency International, which specialises in the fight against corruption worldwide, originally filed a lawsuit in December 2008 questioning the manner in which Bongo, Nguesso and Obiang had acquired over 160 million Euros worth of real estate in France. Transparency International says that the money used to buy the properties was embezzled from the public treasury of the respective countries. In May, a French judge agreed to hear the case, but today the Paris court of appeal rejected the investigation. “Today it is champagne all around for the gang of Franco-African crooks that organize and profit from the looting of African public funds,” said Transparency International’s lawyer William Bourdon. Transparency International intends to file an appeal against the decision which it considers to be legally dubious. “Today’s decision is all more regrettable as it prevents the opening of a judicial investigation, even though it is beyond question that the assets identified by the police in this case could not possibly have been accumulated through any legal means,” said Transparency International. The French government had resisted calls to investigate Transparency International’s claims. It is quite conceivable that direct pressure from the Sarkozy administration were exercised on the court of appeal to drop the case. 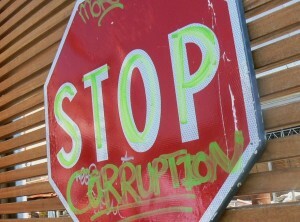 To find out more about Transparency International and their much needed fight against worldwide corruption click here. August 28, 2014 Ebola: Zombie Apocalypse, Biological Warfare or Marketing Hype?